Hospitals, airports, tree-lined streets; people at work, people at play and people at worship; those in need of protection and those charged with protecting them – there is no safe place, no safe gathering. They are being killed abroad and here in my own country. There are no borders, no lines drawn on a map, that say “These people on my side are included in humanity, and those on the other side are not.” The Great Command to love your neighbor is not limited by proximity, nor by nationality, nor by lineage, nor by beliefs. Jesus explained it once by describing a scene where a man had been beaten and robbed and left for dead on a desolate stretch of road. Twice along came people you would expect to stop and help, people who would feel some responsibility to and kinship with their countryman in need. They each stepped aside and went on their way without pause. Then came someone you would expect to have no reason to help, a foreigner and outcast. This stranger instead stopped and bandaged the victim’s wounds. He placed him on a his donkey and brought him to the nearest town. He bought the victim a room at an inn, nursed him overnight, and paid the innkeeper to continue caring for the man. He left enough money to provide for the victim’s needs, promising to return and reimburse the innkeeper should the expenses be even greater. You see, the stranger and the victim were neighbors though they were of differing nationalities and had never met, and when one neighbor hurt the other came alongside. Because when it happens to one it happens to all, and it’s happening right now to your neighbor. This entry was posted in Uncategorized and tagged e pluribus unum, Good Samaritan, John Donne, Love your neighbor, No Man Is An Island, tragedy. Bookmark the permalink. It’s not just people we’ve never met. Oh it’s them too certainly. But the parable is much harder hitting than that. It is about people we have been taught to hate, people we have been taught are corrupt through their heredity, how they think and what they do, people so defiled we are taught to respond to with a gag reflex. One thing I wonder about the parable, was the expert in the law showing deep insight when he said the real neighbour was “The one who had mercy on him”? Or was it too difficult to say ”The Samaritan”? Perhaps both. “Samaritan” might have been a hard word to utter, but perhaps labeling the Samaritan as merciful was a catharsis of sorts, a freeing event. The Jews were taught to hate the Samaritans so thoroughly that decent working class men like James and John would have had no compunction about wiping out an entire Samaritan village. I’ve thought several times that the modern version of the Good Samaritan would use a Middle Eastern Muslim from ISIS-held territory as the Samaritan. I wonder if John and James felt abashed when hearing the Good Samaritan parable soon after they wanted to wipe out a whole Samaritan village. I am still processing the events of last week. The blame placing in social and regular media has been particularly disconcerting. It seems to be another symptom of the same anger and frustration that underlie so many of these actions. Thanks for the reminder that Jesus shows us a better way!! We seek to place bale as a way to make sense, and at times as a way to dull our fears, I think. The only answer I’ve seen is the one Jesus gives: love others as God has loved me. 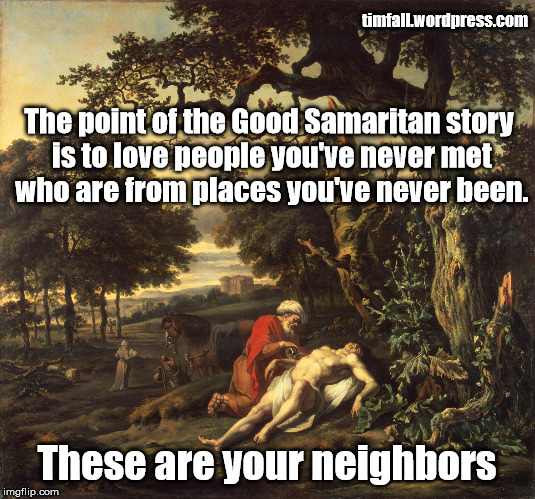 I have heard so much mention of the Good Samaritan parable this past week or so. It gives me hope that in spite of the hate, God is still working in people’s hearts to remind us that we are all His children. Thanks for this, Tim. That gives me hope as well, Jeannie. Amen indeed, LL. I am glad to be loved and glad God wants me to be part of his love for others.